High energy impact compaction involves the transfer of compaction energy into the soil by means of the lifting and falling motion of non-circular rotating masses. The rotation of such masses to their highest point results in an effective potential energy build-up. Further rotation of these masses results in the conversion of this potential energy into a falling kinetic energy, which is transferred to the soil upon the impact of the lowest point of the masses with the surface of the soil. The amount of energy transferred, in the form of compactive effort, is closely related to the amount of potential energy generated in the lifting process. The high energy and relatively large depth of influence of the Landpac® ground improvement equipment makes it an effective mechanism of improving the engineering properties of deep in-situ fills and weak natural soils. Improvements can typically be achieved in such in-situ materials to depths of up to 2m to 4m depending on the material type and moisture regime. This deep in-situ ground improvement can thus eliminate the need for costly excavation and the replacement and compaction in thin layers associated with improving such in-situ materials utilising conventional compaction equipment. In-situ ground improvement using the Landpac® high energy compaction and monitoring technologies comprises the improvement of the engineering properties of in-place ground materials at depth, both above and below the ground water level. Material strength is increased and compressibility and future settlements are decreased as a result of the densification process. The primary objective of this GIS in-situ ground improvement process is to convert a heterogeneous material into one that has more uniform and better engineering properties. 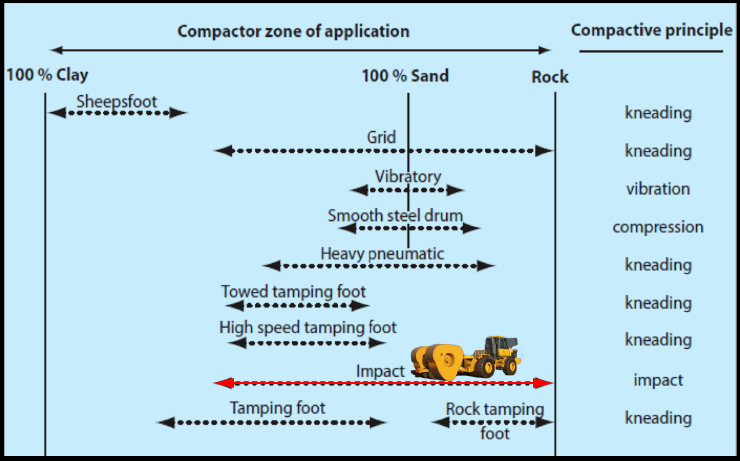 In addition to improving the engineering properties of the existing in-situ materials, the Landpac® high energy compaction process acts as a proof roller and is able to identify pockets of soft material or excessively weak materials that are unsuitable for improvement by compaction. Such pockets can then be remediated either by additional compaction, if appropriate, or by removal and replacement with more suitable materials. The degree of improvement of engineering properties of in-situ materials depends largely upon the total amount of compaction energy applied to the material i.e. the more energy input to the material, the greater the degree of improvement. The result of in-situ material treatment using Landpac® high energy compaction is dramatic and immediate. Induced settlement is typically 5% to 10% of the depth of material being treated whilst the strength and density of the material, as measured by in-situ testing, are typically improved by a factor of between 2 to 6 times. The depth of influence of the Landpac® high energy in-situ ground improvement process is related to the specific Landpac® equipment rating with improvement depths of 2m to 4m being commonly recorded by cone penetration and dynamic probe testing. 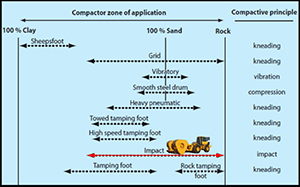 The depth of influence is also dependent on other factors including the material type and stratigraphic features, efficiency and energy loss of the compaction process on soft surfaces, the surface contact pressure of the Landpac® high energy compactor drums and the method of application of the compaction energy (i.e. drum configuration). 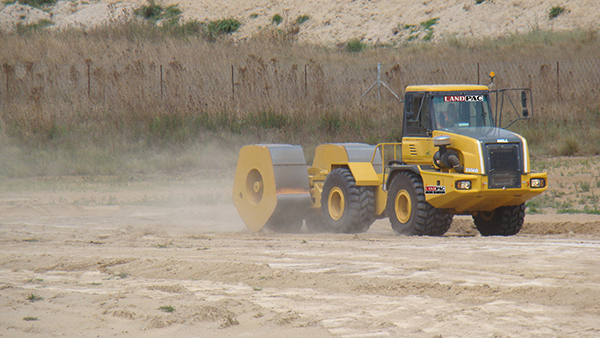 In contrast to the relatively thin-lift compaction capabilities of conventional compaction equipment, Landpac® ground improvement technologies are capable of achieving thick-lift compaction of fills, in layers of between 600mm and 1500mm depending on the material type and moisture regime. These capabilities allow for vastly increased productivity rates and complete “in process” quality control monitoring that result in greatly improved utilization of earthmoving equipment and reduced compaction testing costs, whilst ensuring a far greater level of quality assurance than can be achieved using conventional compaction equipment. The ability of Landpac® ground improvement technologies to compact in thick lift layers has a number of productivity advantages. The most obvious advantage is that a far greater volume of material can be compacted to specification in any time period using GIS ground improvement equipment than could be compacted using conventional equipment. Another advantage of using thick-lift layer works is the reduction in cost of the placement of the any given volume of material due to the reduction in levelling works. Typically, one thick-lift layer that can be compacted using Landp Landpac®ac ground improvement equipment would equate to 3 to 4 thin-lift layers that would be required for compaction using conventional compaction equipment. This obviously reduces the amount of time and equipment (e.g. Bulldozers, graders etc) that would need to be utilized for layer levelling by a factor of between 3 to 4 times for any given volume of material. A less obvious, but equally valuable advantage of using thick-lift layer works, is that the maximum particle size of the material being placed for compaction can be far greater for thick-lift layer works than for the thin-lift layer works. As a rule of thumb, the major dimension of any one particle within a layer may be up to two-thirds the dimension of the layer thickness. Particles within a thick lift layer that can be compacted using Landpac® ground improvement equipment can thus have a major dimension of 3 to 4 times that of particles within a thin-lift layer associated with compaction using conventional compaction equipment. This means that costs associated with the breakdown and screening of material being placed in layers can be massively reduced if the material is to be placed and compacted in thick-lifts. This is of particular value when compacting rock fill layers where the breakdown and screening costs tend to be extremely high. Another less obvious advantage of thick layer works is a vast reduction in the amount of material left exposed to the elements upon placement. This in turn means that the risk associated with drying out of the material in arid climates is reduced whilst the risk associated with the material becoming excessively moist due to exposure to rain in wet climates is also reduced. 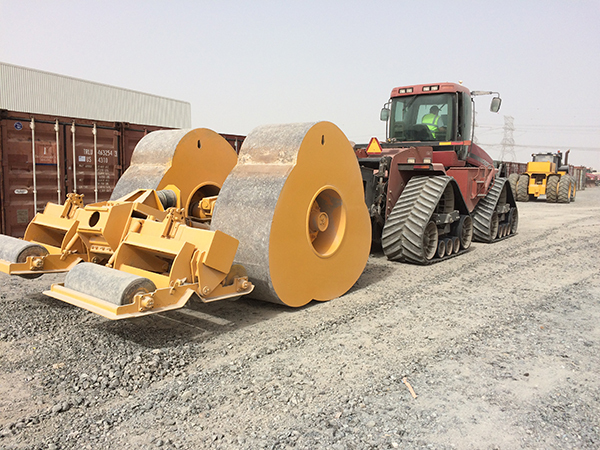 The ability of the Landpac® high energy impact compaction equipment to pre-stress material from the surface to a stress level higher than that which the material is likely to experience during service, makes it ideally suited for the application of “proof-rolling”. Such a process of proof-rolling is especially suited for detecting any weak areas associated with poor materials or excessive moisture conditions which can be improved by material replacement and/or remedial reworking. This proof rolling/induced settlement application involves the treatment of the entire site with repeated coverages using Landpac® impact compaction equipment until the rate of settlement of the surface is minimised (typically less than 20mm over the previous 5 coverages). This process, commonly referred to as “compaction to refusal”, greatly reduces the potential for future plastic deformation of the material and practically eliminates the potential for future differential settlement of the material under service loads. The net result of this proof-rolling process is the provision of a technique that allows for a vastly increased level of certainty regarding the load bearing capacity and a reduction in the potential future settlement under load of the area being treated. This can in turn be used to ensure a greater level of confidence for the design of any engineering works that are to be performed on the area that has been proof-rolled.